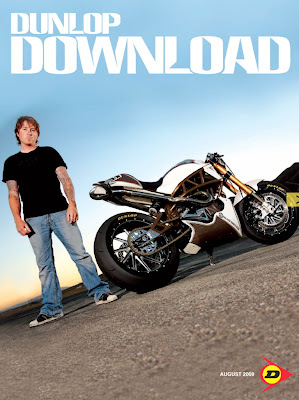 Remember the post a few weeks ago about the custom Buell XB9 “Bu-hell”, well Roland and the bike made the cover of the August issue of Dunlop Download magazine, a fully interactive digital publication with links to videos and photo galleries, as well as feature stories and up-to-the-minute news highlighting the latest happenings in the Powersports field. This issue contains coverage of the AMA Motocross and Pro Road Racing season, ATV racing, X-Games 15—which was dominated by Dunlop riders—and a special cover story featuring Roland Sands’ hand-built “Bu-Hell”. Along with the article a stand-alone poster was created with Roland and the Buell.